I have a 1TB FireWire hard drive that is about a quarter full. I’d like to partition the drive but don’t want to have to back up all my data to another drive, partition this drive, and then move my data back. Is there a way to safely partition it with my data still on it? 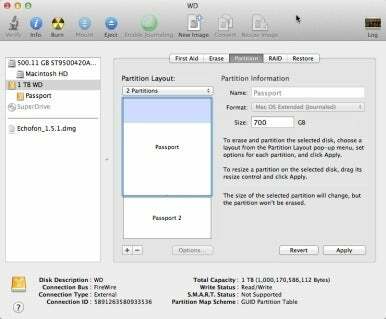 Mount your hard drive and launch Disk Utility. In the drive pane select the hard drive you want to partition (not the volume on the drive but the drive itself). Click on the Partition tab that appeared when you selected the drive. The Partition Layout area will show you a graphic representation of your hard drive—it will be a single partition partly colored blue (the blue indicates the portion of the drive that contains data, but not its location on the drive). Your first step is to resize this partition. You can do that by dragging up on the bottom right corner of this image (where you see the three gray lines) or you can simply enter a new value in the Size field (700GB, for example). Now click the Plus (+) button below the partition to add another partition. By default it will consume the remaining space on the drive. You can add more partitions, if you like, by clicking on the Plus button. To change their size use the Size field. When you’re ready to partition the drive, click on the Apply button. (If you change your mind, click on Revert to put things back the way they were.) Disk Utility will go about its business, making sure that your data remains on the first partition as well as creating the additional partition.